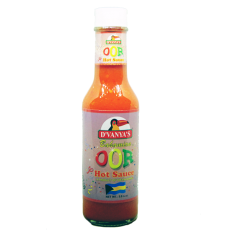 Dvanyas newest and one of their hottest sauces available. This red sauce is quickly becoming an island favorite. This sauce adds a quick heat that lingers and warms. This sauce is slightly thicker, more of a crushed sauce as compared to their others. Go ahead and put some sun on your tounge!